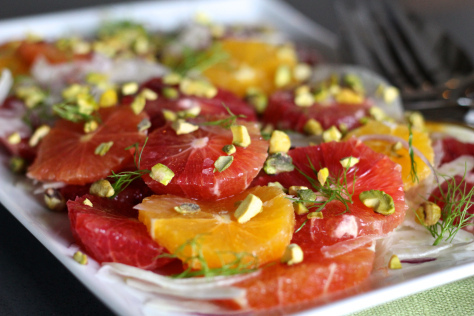 This gorgeous fennel orange salad tastes just as good as it looks! The fresh, juicy citrus and crisp, sweet fennel is perfect for winter. Citrus! Sweet, Sweet (and sour) Citrus. I love a winter citrus salad, and this stunning fennel orange salad is one of my absolute favs! Without your glowing jewel tones and bursts of vitamin C, how would we ever survive the harsh brutalities of winter? Just seeing citrus this time of year gets me feeling all bright eyed and bushy tailed. I just can’t get enough of these colors! 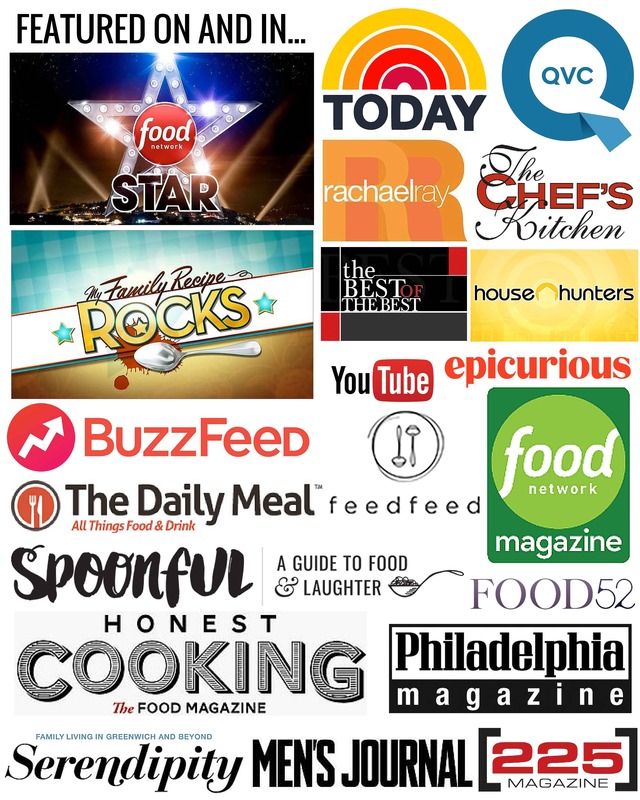 We eat with our eyes first, and this photo is some serious eye candy. Aside from hibernation, citrus might be the only thing I actually like about winter. Everything else can go light itself on fire. There are soooo many ways to incorporate these gorgeous, vitamin-packed gems into your diet – like in this sweet and juicy fennel orange salad! In fact, I start every morning with a big mug of hot water with lemon (followed by an even bigger mug of coffee). Lemons are great for alkalizing the body and the hot water gives you a shot of hydration, which helps to cancel out the dehydrating effects of coffee. There are all kinds of vibrant citrus fruits in-season this time of year, each great for adding a zing of acidity and splash of color to a dull winter’s day. 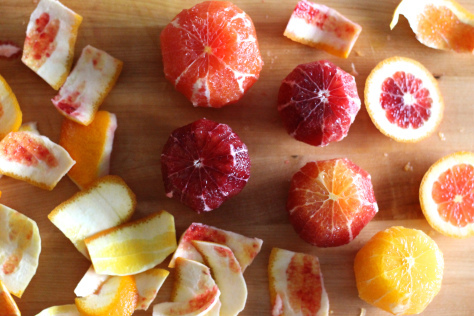 I’m a big fan of just peeling an orange, grapefruit, tangerine or clementine simply to eat as a snack. But today, I wanted a little something more. Enter: Fennel & Orange Salad. A Sicilian classic. Sicily is known for their citrus, and for their classic fennel orange salad – one day I’ll get there to find out exactly why. But for now, I’m going to close my eyes really tight and pretend I’m lounging on the shores of Palermo, eating all-of-the-citrus-everything. Ya gotta make due with whatcha got, right? Even if it’s only your imagination. This is a beautiful, show stopping fennel orange salad that’s perfect for serving at a fancy-schmancy dinner, yet easy enough to jazz up a simple week-night supper. 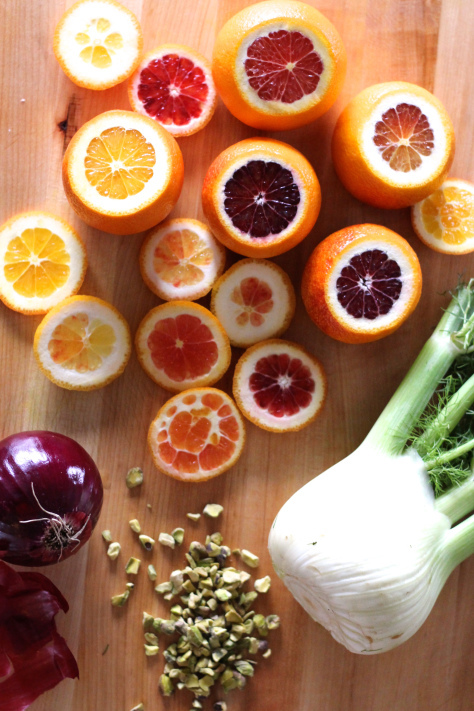 Any type of orange will get the job done for this fennel orange salad, but I love mixing up the different varieties to create a whole spectrum of vibrant hues and flavors. 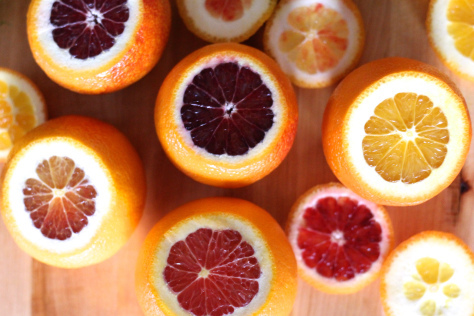 Blood oranges range from a speckled orangey red to a deep bloody purple, with a mellow floral flavor. 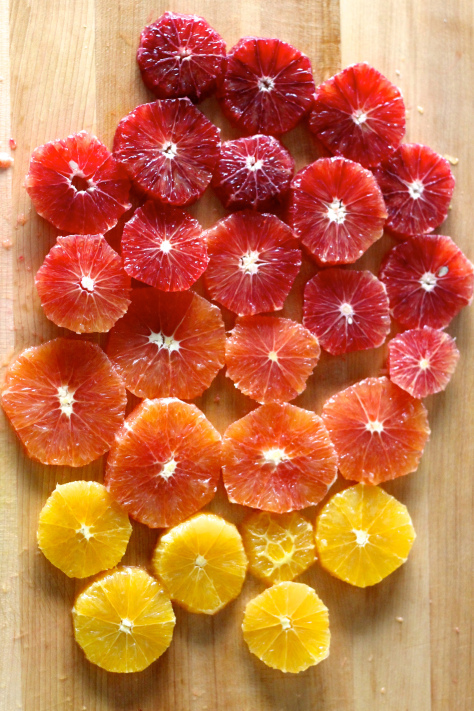 Cara Cara oranges look like ruby red grapefruits inside and have a perfect balance of sweet and tart. Valencias give you that classic orange color and bright citrusy flavor we all know and love. Together they create a work of art for your eyes and mouth. The rest of this fennel orange salad is a breeze to throw together: Raw shaved fennel for a sweet, mild anise flavor and crisp refreshing crunch; red onion for a savory bite; toasted pistachios for texture and nuttiness; crunchy sea salt to bring out all the flavors & extra virgin olive oil to round it all out. Nothing more, nothing less. Sicilian simplicity at it’s finest. Brighten up your taste buds and your spirits! 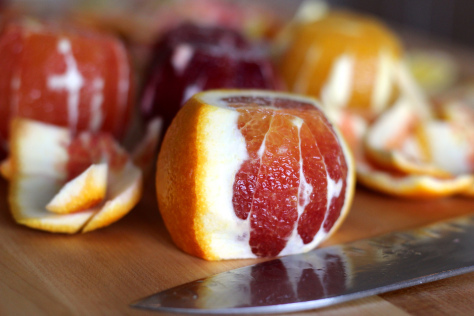 Begin by slicing the top and bottom of each orange to reveal the flesh. Set a cut side down on the cutting board and use your knife to slice down the sides to remove the peel and as much white pith as possible. Turn the oranges on their sides and slice into rounds. Use a sharp knife or a mandoline to shave the fennel and red onion into very thin slices. Arrange the oranges, fennel and onion on a platter, layering the fennel and onion between the slices of orange. Drizzle with olive oil, then sprinkle with pistachios and sea salt. Scatter the reserved fennel fronds around the plate if desired. Serve immediately. Okay, lady. Now this is getting a little freaky! I served almost the same dish last evening for dinner. I do supreme the oranges rather than use rounds and I use Endive as counterpoint to the shaved fennel. This makes a terrific, healthy meal when served with a simple pan seared white fish like tilapia or flounder. The thinly shaved red onion adds just the right amount of bite. Next time I do this I will use the pistachios – never considered going for that type of added crunch and texture. Thanks for the tip.